We human beings have trouble with infinity - yet infinity is a surprisingly human subject. Philosophers and mathematicians have gone mad contemplating its nature and complexity - yet it is a concept routinely used by schoolchildren. Exploring the infinite is a journey into paradox. Here is a quantity that turns arithmetic on its head, making it feasible that 1 = 0. Here is a concept that enables us to cram as many extra guests as we like into an already full hotel. Most bizarrely of all, it is quite easy to show that there must be something bigger than infinity - when it surely should be the biggest thing that could possibly be. Brian Clegg takes us on a fascinating tour of that borderland between the extremely large and the ultimate that takes us from Archimedes, counting the grains of sand that would fill the universe, to the latest theories on the physical reality of the infinite. Full of unexpected delights, whether St Augustine contemplating the nature of creation, Newton and Leibniz battling over ownership of calculus, or Cantor struggling to publicise his vision of the transfinite, infinity's fascination is in the way it brings together the everyday and the extraordinary, prosaic daily life and the esoteric. 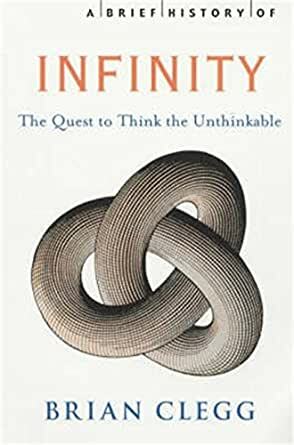 Whether your interest in infinity is mathematical, philosophical, spiritual or just plain curious, this accessible book offers a stimulating and entertaining read. 4.0 颗星，最多 5 颗星Clegg held my interest to the very end. Algebra and math subjects often loose me at the first chapter. Clegg held my interest to the very end - pun intended. There is repetition but I retained more than I usually do with these subjects. The take-home was my own "learned opinion". Enjoyable book and was at the end before I knew it.....not a book of infinite tedium!!! 3.0 颗星，最多 5 颗星Should be of interest to people interested in math and math history. In Infinity Brian Clegg traces the history of this often perplexing mathematical idea. We are introduced to many historical figures who wrestled with some aspect of this concept including Bertrand Russell, Galileo, Plato, Augustine, Archimedes, Descartes and Bernard Bolzano. Georg Cantor, the founder of set theory, is prominently mentioned in connection with the mathematics of infinity. Clegg says that mathematics is not based on the real world, but rather on a carefully constructed set of rules. He also cites some famous paradoxes such as David Hibert’s hotel and the paradox of Gabriel’s horn. Mathematicians and people interested in math and math history may well enjoy this book. I personally found it rather difficult to follow and not very interesting, but I am not really much interested in math. Review of A brief history of infinity: the quest to think the unthinkable by Brian Clegg. CITATION: Clegg, Brian (2002). A brief history of infinity: the quest to think the unthinkable. London: Robinson. Reviewer: Dr W. P. Palmer. This reviewer has an interest in the history of science and found the lives of the various mathematicians, given briefly, as one of the positive features of the `A brief history of infinity'. Several of the mathematicians mentioned also had scientific discoveries to their credit, such as Newton and Galileo and the historical information about these scientists, though brief, appeared accurate. The mathematical work of Galileo mentioned showed him to be more of a polymath than I had realised. However, when Clegg mentions `Brownian motion', Clegg's claim to historical accuracy is severely dented. Robert Brown, not James Brown (p. 213), is usually considered the discoverer of the phenomenon of Brownian motion, though the phenomenon had been noticed half a century earlier. James Brown was a Scottish clergyman and the father of Robert Brown (1773-1858). Robert Brown was Scottish and not English. Errors, such as this, should have been edited out. What of the book more generally? A number of other reviewers found the writing a little dull and I have to agree with that opinion. However, I did learn a lot from the book and I have a fuller view of the concept of infinity than I had previously. I liked the last chapter with its story of Gabriel's Horn, a paradox that was new to me. Overall, though not enthused, I find that it was a worthwhile read. There is almost a pun in the title: how can you have a brief history of infinity? However, this book by Brian Clegg is part of a series, so it is stretching bounds of probability to suggest that the whole series is named just to get a pun in a title! I have not read any of the others in the series, but from their titles, they seem to be of a historical nature, rather than concepts and ideas. The sub-title of this volume is also interesting: "the quest to think the unthinkable". That statement gives a key to the book. What does the notion of infinity give us? For me the first 100 pages of Clegg's book do not really work. It is both slow, and nebulous. However, after that, it opens up, and gives a good narrative of the progress towards the unreachable. Strangely, that is not just the infinitely large, but also the infinity small. Somehow "proper" numbers are sandwiched between the immeasurable at either ends of the spectrum. Clegg falls on the side of the usefulness of ideas, rather than the sheer understandability. Calculus, in both the Newtonian and Leibnizian forms, is introduced as "something that works". It was only later that the need for infinitely small is eliminated from calculus - by then this mathematical tool had been very useful in solving many real problems. After the slow labouring start, the volume CAN be a beginner's guide to the subject, but is probably not be for the faint-hearted. It will help your understanding if you are familiar with ideas from modern mathematical thinking. If not, the notion of there being different `levels' of infinity can come as rather a jolt. How can two numbers, both of which are not countable, be different? How can there be the same number of odd numbers as there are of odd-and-even numbers? It is not surprising that the man behind set theory, Georg Cantor, lost his sanity when investigating the infinitely large. In essence, the book covers so much more than just infinity. It really does go "to infinity and beyond". Infinity is a strange idea, but one that underlies many of the advances that have taken place since the start of the 20th century. Advances in number theory, cosmology, physics and atomic physics can be better understood if a basic understanding of infinity is grasped. Clegg covers these parts well. The title was not a pun. However, Clegg does not disappoint in his last sentence. "When it comes to infinity, the possibilities are, perhaps inevitably, endless". I suppose he had to say that, didn't he?